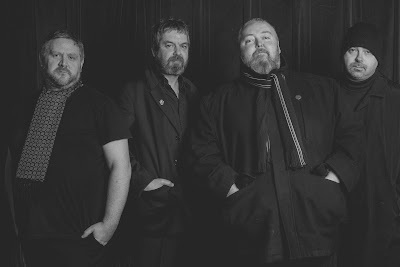 I've been avoiding becoming a fan of Pugwash for so long now but, really, it's a losing battle. With the upcoming release of Play This Intimately (As If Among Friends), out Friday on Omnivore Recordings, I think I'll be firmly in the Thomas Walsh and Pugwash camp. All of my friends with similar taste in music should be happy that they don't have to yell at me anymore about how good this band is. I mean, with appearances from Jeff Lynne and Neil Hannon (of The Divine Comedy) on this one, how could I fight it anymore? "Hung Myself Out To Dry", to use an example, insinuates on the back of a melody that's equal parts Hannon and Lynne. And to think that only a few years ago I'd never have envisioned a band who'd make that necessary leap between those acts and link them up sonically. This is really a splendid record and even if "Oh Happy Days" didn't manage the miracle of getting Ray Davies of The Kinks to appear alongside Neil Hannon of The Divine Comedy and Andy Partridge of XTC it would still be a great song. Ironically, it's the supple "Silly Love" that sounds more like Partridge than a lot of the other cuts on this record as it mixes a late period XTC buildup with a chorus like something Paul McCartney would have written in the 1980s, and yet, Partridge is not on this one. "The Fool I Had Become" uses a jazzy approach, while "Clouds" charms in a style not entirely unlike that of a Jobim classic. "All The Way From Love" offers up a sublime tune that Roy Orbison would be covering if he were still alive now. An absolutely stunning melody, this one. Elsewhere on the record, you've got the upbeat charms of "Kicking and Screaming" which recalls the best power pop gems of earlier eras -- even throwing in the faintest hint of late period Cheap Trick, oddly enough -- and the assured mid-tempo beat of "Lucky in Every Way" which sounds like something left off of the That Thing You Do! (1996) soundtrack in some weird way and I guess that means that I'm offering up an admission that it sounds vaguely American and like the Fountains of Wayne then. Album closer "We Are Everywhere" takes another approach altogether and mixes what sounds like a spin on The Beatles' "Because" with the sort of backing track that the Flaming Lips would kill for. It is a beautiful piece of music even if it's not riding such a buoyant melody like most of the best Pugwash songs do. There's something reassuredly great about Pugwash. Quality control here is remarkably high and a listener or new fan is constantly asking him- or herself: "How the hell did I not discover this band earlier than now!?!" Yes, they are that good. Pure pop treasures all, the cuts on Play This Intimately (As If Among Friends) are destined to find their way into your heart in a matter of days. Pre-order your copy now via this link. Follow Pugwash via Omnivore Recordings or the band's official Facebook page.